Te Apiti - Manawatu Gorge is a diverse forest ecosystem in a dramatic landscape, right at our backdoor. It is a place where people from across New Zealand to connect with our precious natural environment. The Gorge is home to many native animals and unusual plant communities. Taonga species such as titipounamu (riflemen), karearea (NZ falcon), kereru (NZ wood pigeon), giant maidenhair fern and northern rata are found here. In order to protect our native flora and fauna biosecurity control is undertaken through a range of partners including landowners, Iwi, DOC and Horizons Regional Council. 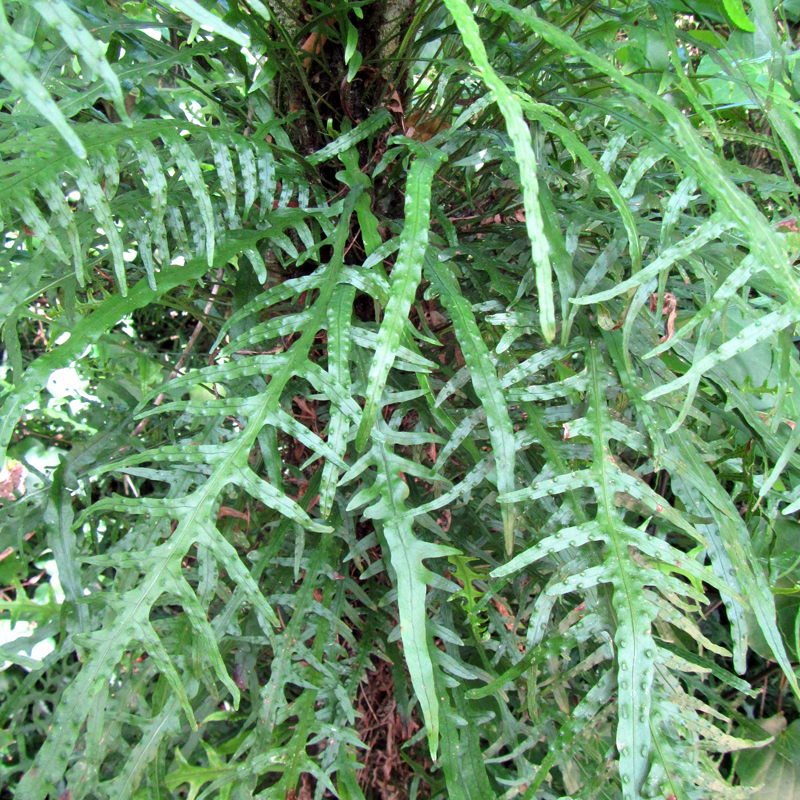 Hen and chicken fern gets its common name from its production of bulbils (chicken) on the upper side of the fronds (hen). These bulbils fall from the parent plant, take root in the soil and grow into new ferns. Only seven of New Zealand’s ferns are edible. The pikopiko fern tips are one of these, and are known as bush asparagus. Pale green with brown speckles, they are eaten as a vegetable. Māori used the fronds for bedding, the roots were eaten, and an infusion of the roots was drunk to treat skin diseases. The young tips were a favourite kinaki (relish) for potatoes. Microsorum pustulatum is often epiphytic, meaning it grows harmlessly upon other plants usually trees. This fern is native to Australia and New Zealand and is common in coastal to montane areas. Hound’s tongue fern, or kowaowao, has thick rhizomes (stems) that you can see climbing up trees, usually in slightly drier places. It gets its common name from the shape of the young fronds which resemble a panting dog’s tongue. Māori used kowaowao to line and cover baskets in which hīnau meal and tawa kernels were cooked as it gave a pleasant flavour. The young stems were cooked and eaten as greens. Pneumatopteris pennigera is a native tufted ground fern which sometimes develops a small, slender trunk. It grows along streams and damp gullies in very shaded areas, hence it’s common name of gully fern. It can be found throughout the North Island, the western side of the South Island, Three Kings Islands and the Chatham Islands. It also grows in south eastern Australia. Māori used piupiu fronds for wrapping hangi food. Young fronds were eaten as greens. Blechnum refers to the family of ferns this one hails from, while discolor refers to the contrasting greens displayed on the fronds. Crown ferns are found throughout New Zealand and can become the dominant vegetation on the forest floor. Like all Blechnum ferns, it has separate fertile and sterile fronds. Māori wrapped kiore (polynesian rat) in petipeti fronds for hangi cooking. They bent over the fronds to use as track markers – their pale undersides are visible even at night. 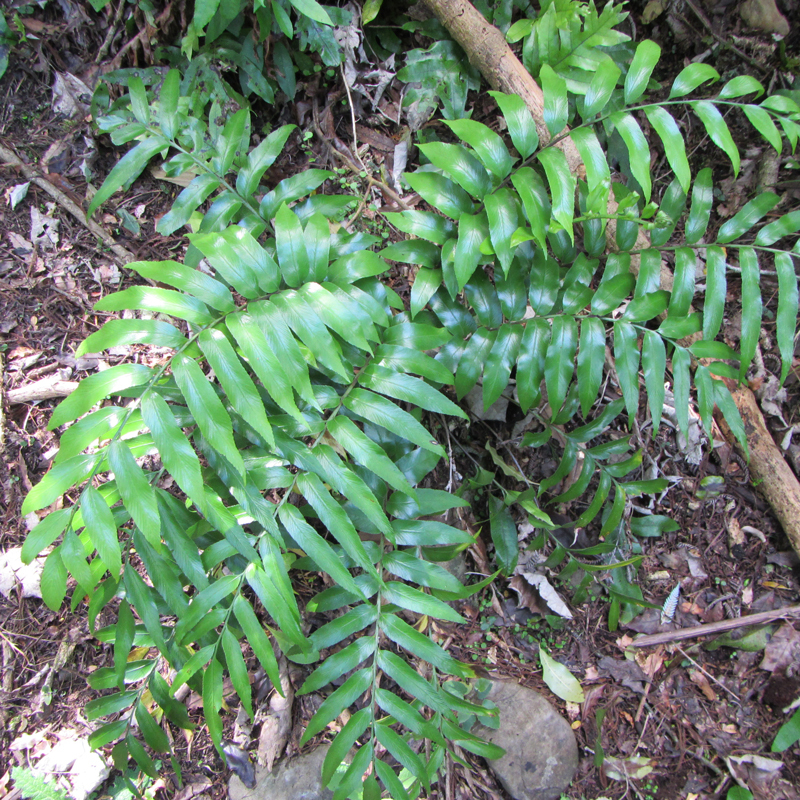 Endemic to New Zealand, this climbing fern is found throughout the country. It can grow on the ground, however is more commonly seen climbing as an epiphyte on tree trunks, rocks, and urban structures. It has a long creeping rhizome or stem, with unusual leathery thick tongue shaped fronds. These fronds are smooth edged and don’t look like typical ferns at all. The undersides of the fronds are covered in fine hairs that stop dehydration during dry weather. Blechnum fluviatile is a symmetrical fern like a starfish, with ladder-like fronds. Growing in a distinctive ground-hugging rosette shape, its fertile fronds (dark brown and spiky) stand upright from the centre, while the drooping sterile fronds with their nearly round leaflets form the rosette. As the parent plant ages it develops a short trunk central to a surrounding colony. 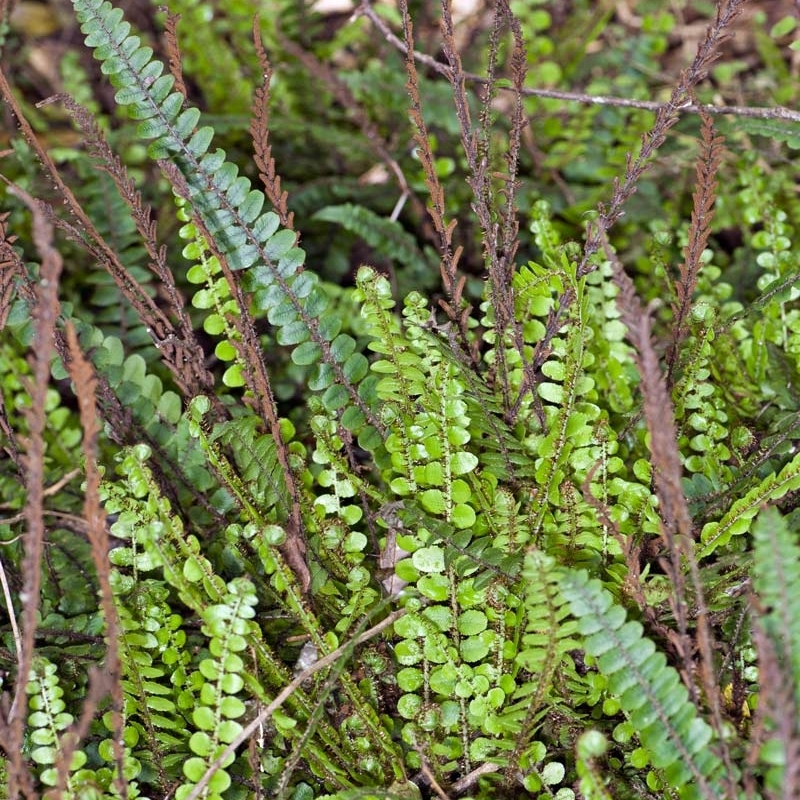 It is a hardy small common ground fern which requires moist, shaded conditions for optimal growth. Kiwakiwa is native to New Zealand and southeast Australia and occurs throughout much of New Zealand’s forests. Māori chewed kiwakiwa fronds to cure mouth and tongue pain and ulcers. This climbing fern has a thin creeping rhizome, or stem. As a juvenile it grows on the ground with thin dull single green fronds. When it starts to climb trees it develops adult fronds, which are divided. The lumps on the upper surface of the fronds are the sori (spore pouches), the spores can be seen on the underside. It can be found in coastal to lowland forests in damp conditions creeping on the ground or climbing trees. Its common name, fragrant fern, comes from its pleasantly scented fronds. Māori used mokimoki for perfume and for scenting oils. Asplenium oblongifolium, commonly known as shining spleenwort, has glossy dark green fronds that can reach about 1.5m in length when growing in optimum conditions of open, shaded parts of the forest. In some environments it can be a highly dominant plant in the forest understory. It is found only in New Zealand and the Kermadec Islands, growing on the ground and also in trees. Asplenium flaccidum, or hanging spleenwort as it’s commonly known, grows from coastal to montane areas. It is usually found growing from the trunks of trees and tree ferns in the bush. Its limp, dull green, hanging fronds reach up to 1m in length and are thick and leathery to touch. This fern is one of a large, distinctive genus of about 20 species in New Zealand. Pellaea rotundifolia, the button fern, is a species of fern found only in New Zealand, where it grows in scrub and forests. It is also a popular garden and house plant. It has been found to contain an insecticide (phytoecdysones) which is toxic to the larvae of the common house fly. Pukatea is found from sea level to 600m throughout the North Islandin wet sites.. It is among the tallest of our flowering trees and can reach 35m in height. Pukatea has breathing roots called pneumatophores above the ground to take in air for the waterlogged root system below. Tiny green flowers grow between October and November on stalks up to 3cm long. After flowering it develops urn shaped seed cases up to 2.5cm long, which split releasing hair-covered seeds that are dispersed by the wind. An extract from the bark containing the alkaloid pukateine is used in traditional Māori herbal medicine as an analgesic. Kohia is a species of passionfruit that is endemic to New Zealand. It can be found frequently in lowland forests throughout the North Island and as far as the middle of the South Island. The mature stems of kohia can be up to 15cm thick and often form snake-like coils on the forest floor in their lower parts but extend from there up into the forest canopy. Flowers that are small and greenish white appear from mid-spring through summer on both the male and female plants. The female plants also form fruits like small balloons which are bright orange. Birds break the fruit open to eat the seeds and often drop the empty cases to the forest floor. Supplejack is a woody evergreen climbing vine endemic to New Zealand. It usually grows in forests, and occasionally in swamps. 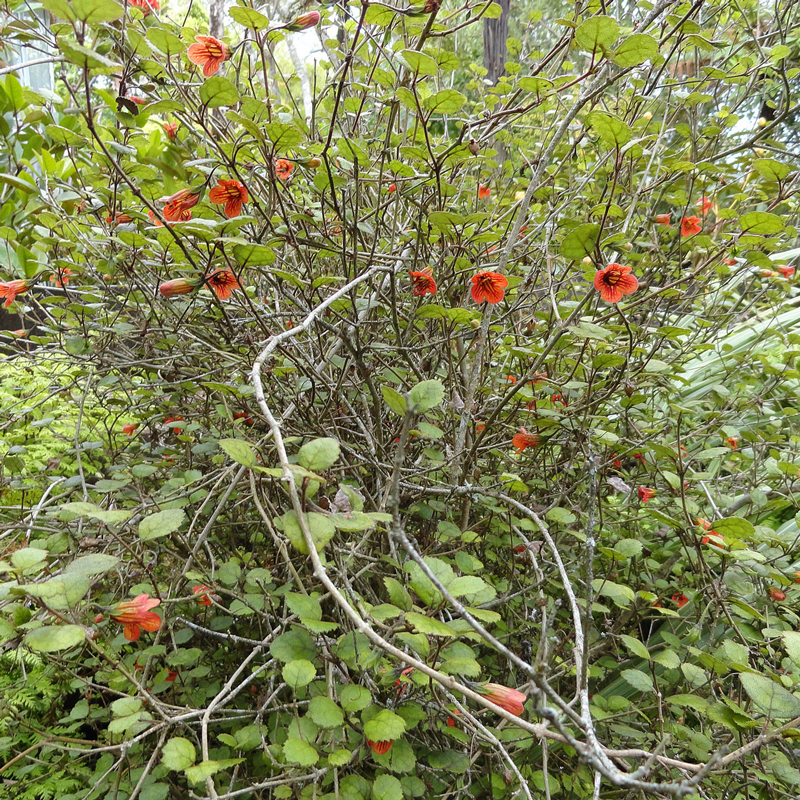 It has hard but flexible black, cane-like stems that climb high up into the forest canopy. Kareao flowers from October – May, but bears clusters of red berries throughout the year. During summer supplejack tips can grow 5 centimetres a day, enabling the plant to climb quickly. Traditionally, supplejack was used by Māori to bind and pull objects. For example, to tie firewood together and for towing small canoes. It also had medicinal uses. Tawa is a tree common in the central parts of New Zealand. It is often the dominant canopy species in lowland forests in the North Island, growing up to 30m or more in height with trunks up to 1.2m in diameter with a smooth bark. Small greenish-yellow flowers are followed by 2.5-4cm long dark purple fruit, on which the New Zealand wood pigeon (kereru) feed and disperse the seed. The aromatic bark was used to make infusions to treat stomach aches and colds, and was particularly enjoyed by travellers as a fortifying drink. The fruit and kernels were a prized food source of Maori, and European settlers alike. A common shrub to small tree in the forest, notable for its shiny heart shaped leaves which are often riddled with holes caused by the native looper caterpillar. The peppery-tasting leaves are poisonous to most other insects. Kawakawa has separate male and female flower spikes often paired together that resemble slender, erect candles. The fruits are small, fleshy and orange-yellow. The leaves have a long history of medicinal use and are used with traditional practitioners in preparing rongoa (medicine). Chewing on a leaf also helps to freshen breath. The giant maidenhair fern is now very rare in the wild in New Zealand, but is common in Australia. Here in New Zealand, the only known wild populations still existing are confined to the Manawatu Gorge, and Woodville area. It grows in moist shaded areas along streams usually on alluvial soils. This pretty fern can grow to 90cm tall and has delicate black stems. Taurepo is the sole representative of this genus and the only member of the Gesneria (Gloxinia) family in New Zealand. This small twiggy shrub grows up to 2 metres tall and is found in coastal to lowland forests, streamside, on steep banks and upland locations throughout the North Island. Taurepo flowers throughout the year but the peak time is October to February. The small, brightly coloured trumpet shaped flowers are mainly adapted for bird pollination and range in colour from brick-red through to orange, and more rarely, a pale yellow. Fruiting occurs throughout the year and the seeds are a tiny dry capsule which develops a few weeks after the flower dies. Ramarama is an endemic species of evergreen myrtle tree which grows to a height of 8m. Its scientific name bullata is from the Latin word meaning bubble. Ramarama inhabits the North and South Islands and is found in coastal and lowland forests margins and stream banks. Its thick leathery, glossy, blistered leaves are 2.5-5cm long and are a broad oval-shape, dark to yellow-green, and mottled and/or spotted with red, maroon or purple-black circular blemishes. White to pale pink cup-shaped flowers, dotted with tiny warts, 12 mm in diameter appear November to March. Small dark reddish-purple berries become black as they ripen and appear in January to June. The Maori used a decoction from the berries which was of benefit in treating bruises. Unfortunately, ramarama is susceptible to myrtle rust, now spreading throughout New Zealand. The nīkau is the only palm species native to mainland New Zealand and it is the world's most southerly growing palm. It grows up to 15m tall, with a stout green trunk which bears grey-green leaf scars. On average two fronds are shed per year leaving behind a leaf scar on the trunk which can be used to give a rough indication of age since the trunk began forming. The nīkau sprouts large clusters of mauve flowers year round, which burst from the base of the lowest frond. The flowers are sticky and sweet with nectar, which attracts insects, especially bees. The nīkau produces fruit that take almost a year to fully ripen. 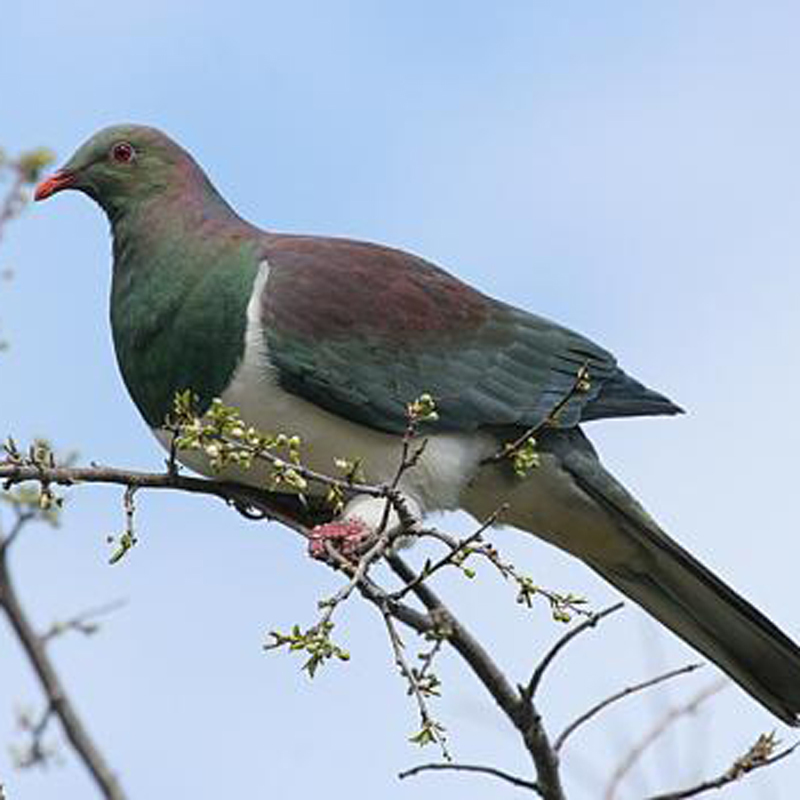 These are a favourite food of the kereru - the native wood pigeon. Nīkau have always had importance in Māori life, with uses ranging from building materials, a food source, and medicinally as a laxative. The northern rata is one New Zealand’s endemic forest giants. This tree can grow up to 30m tall, with a trunk up to 2m in diameter. Metrosideros means ‘iron-hearted’ referring to the immense hardness and density of the timber. It can be common in lower-altitude forests throughout the North Island, and in the north of the South Island. Northern rata can cross with pohutukawa to form hybrids between the two species. The flowers are bright red to dark-crimson and appear late spring through early summer. The fruit is a woody capsule, up to about 6 mm across, which releases very fine hair-like seeds when ripe. Māori had many medicinal uses made from different parts of the northern rata, including relief from ringworm, aches and pains, wounds, cold/flu, toothaches, sore throats and bruising. Tui are easily recognisable from a closer distance with their white throat tufts and blue, green, and bronze iridescent sheen. They play a very important role in the dynamics of our forests because they are one of the most common pollinators of flowering plants, and disperse the seeds of trees with medium-sized fruits. Tui respond extremely well to pest control programmes targeting their main predators; stoats and rats. NZ’s most common heron can be found stalking pretty in almost any aquatic habitat. It’s a tall elegant bird with blue-grey plumage. White faced herons usually nest at the tops of large pine or macrocarpa trees, or occasionally on man-made structures. The teeny tiny rifleman comes in at a whopping 6 grams and is one of our smallest birds. They’re found mostly in mature forests particularly with beech and podocarp species, both of which are predominant in Te Apiti - Manawatu Gorge. 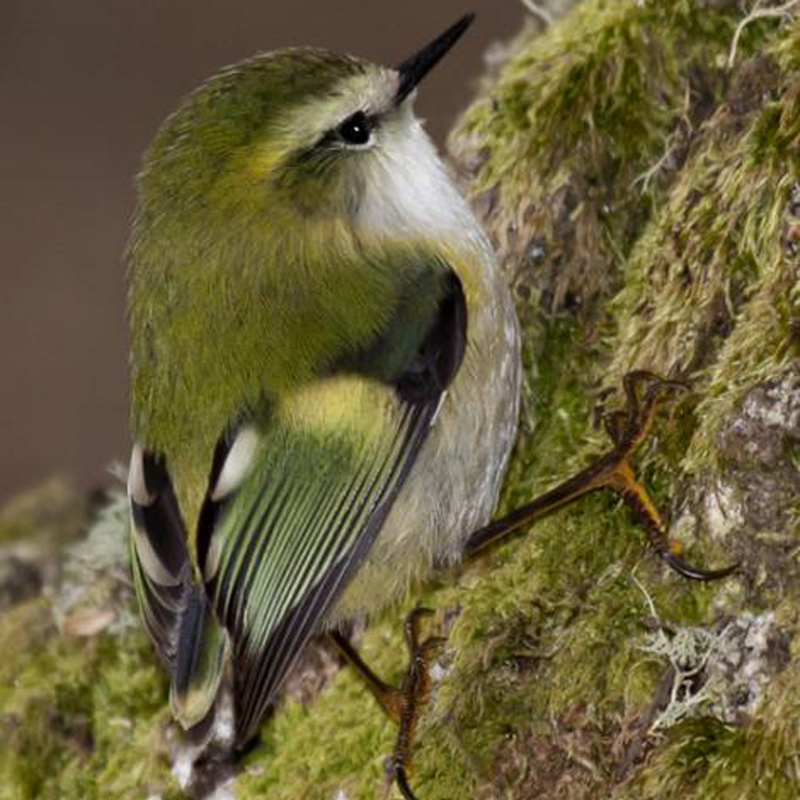 Riflemen are noted to be found in high densities particularly in the Tararua Ranges, however populations are threatened by habitat clearance, and pest animals such as stoats and rats. Another of our smaller species, the tomtit is roughly double the size of a rifleman at 11 grams. Tomtits inhabit forests and shrublands, and are rarely seen in open habitats. Male tomtits are songbirds and are often heard in full song. Both sexes also make short ‘seet’ ‘zet’ or ‘swee’ contact calls. The biggest threat to tomtits currently are introduced mammalian predators such as stoats rats. The paradise shelduck is a noisy waterfowl that could be mistaken for a small goose. Females are chestnut with a white head, while the males are dark grey/black all over. This conspicuous species can be found on river flats in mountain areas. While its numbers are now plentiful, previously excessive hunting severely impacted the abundance of the species. Ruru, or morepork, are NZ’s most well-known owl, with its distinctive more-pork call. These small dark brown, speckled birds have striking yellow eyes and are found in native bush remnants through much of the country. Morepork are roughly 1.5kg and are at risk of predation when nesting from cats, possums, rats and mustelids. The little shag are a small shag species growing to anywhere between 400-900grams, and can be found in both saltwater and freshwater habitats. Little shags have a huge variation when it comes to their plumage, but are mostly black and white with yellow bills. While they’re fairly common north of Auckland, they’re less likely to be found in the lower North Island. The native kingfisher is well-known with its easily identifiable green-blue back and yellowish underside. Found in range of habitat, the key necessities are an elevated perch to hunt from as they dive-bomb their prey, and banks or trees to burrow their nests in. Kingfishers are occasionally caught by feral cats. Our native pigeon is a large bird weighing over half a kg. Kererū are distinctly marked with white feathers on the underside of its body, and blue-green plumage with purple-bronze iridescent on its neck and wings. They’re mainly at threat from predator pests including possums, stoats, rats and cats, particularly while they’re nesting. The swamp harrier is a bird of prey that calls Te Apiti - Manawatu Gorge home. While kahu are abundant in most of NZ, they’re less likely to be found in large areas of forest. They’re opportunistic hunters, eating both dead and live prey. They’re the largest of the 16 harrier species found worldwide, weighing 650g for the males and 850g for the females. Grey warblers are more often heard than seen, with a loud distinctive song. Riroriro are another teeny tiny endemic bird coming in at 5.5-6.5 grams – that’s a tad heavier than a single dice. They are found in woody vegetation at mid to high levels of the canopy. With its distinctive fantail and loud song the NZ fantail is one of our best known birds. Fantails are fairly confiding as they will often come within a metre or two of people while chasing small flying insects. While the fantail copes fairly well in a variety of habitat from native forest to farm shelterbelts or suburban parks, nesting adults, eggs and chicks are not immune to being preyed upon by animal pests such as possums, stoats and rats. The NZ falcon can be found in dense native bush as well as open habitats such as tussocklands. They’re a magpie-sized bird of prey, feeding mostly on live prey such as small birds and rabbits, while juveniles will often feed on insects while learning to hunt. Our falcons are recovering from being an at-risk species. While they are often aggressive in protecting their eggs and young, they are still threatened by stoats, rats and possums. Bellbirds are deep green with wine red eyes. They feed on nectar, fruit and insects and are found in a variety of habitat across the country. They play an important role in pollinating flowers of native species as they feed on the nectar. Although bellbirds are still widespread on the New Zealand mainland, research has shown that mammalian predators, such as rats and stoats, keep their numbers low. 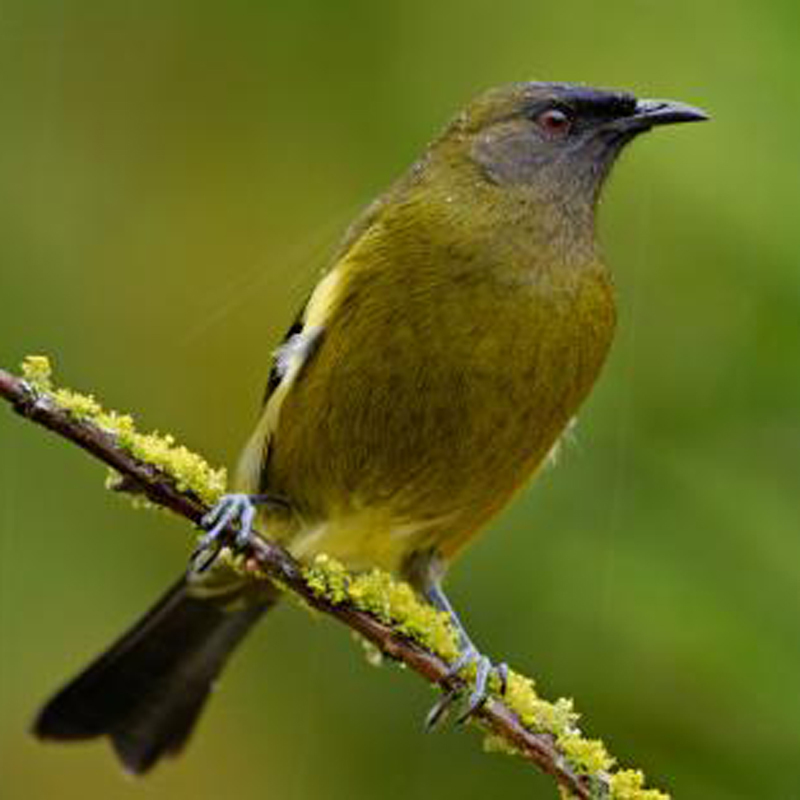 A bellbird’s song varies depending on where in the country they live, but all comprise of ringing notes that are easily recognisable.